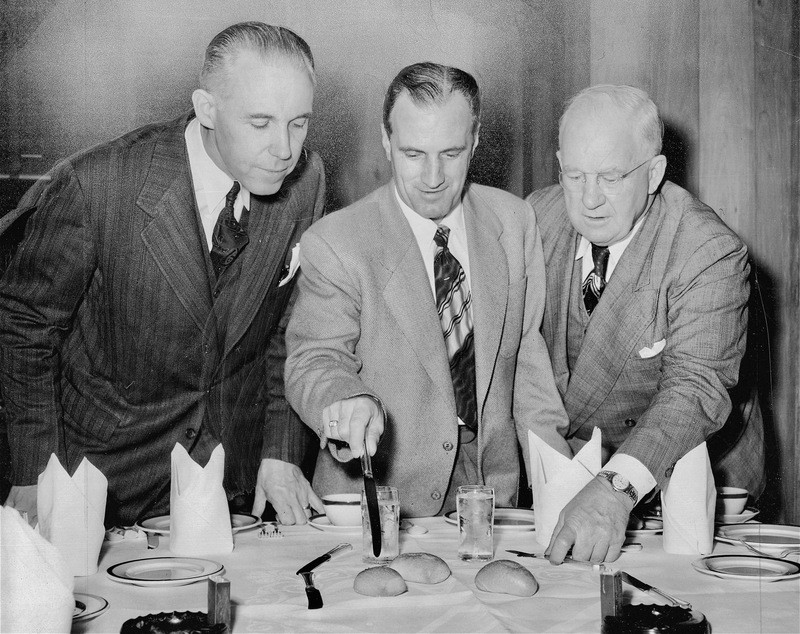 Bun-on-Bun: NHL pesident Clarence Campbell (left) and Detroit GM Jack Adams (right, no moustache) get the lowdown from Red Wings’ coach Tommy Ivan (middle) on who goes where when your dinner rolls are outmanned in the defensive zone. It was October 12, 1949, and Campbell was in town to see the Red Wings’ season opener against Boston. Lamoriello’s teams have always been like that. Back when he was running the New Jersey Devils, his reputation of an old-school conservative who stressed conformity earned him the nickname “Tal-Lou-Ban.” Some even believe he influenced New York Yankees longtime owner George Steinbrenner into instituting a similar edict, resulting in star Don Mattingly being benched for growing his hair too long. Turns out there’s a whiskery history here, going all the way back to Toronto’s second NHL season. 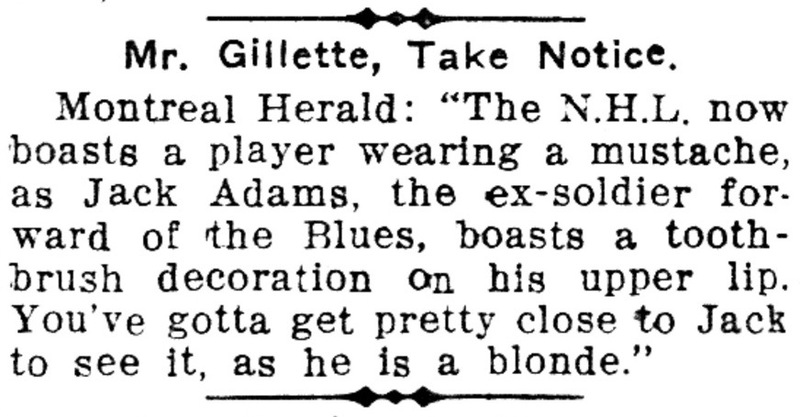 Jack Adams, we know, wore the league’s original moustache. Not so well known is that this year is the centenary of Adams having Lamoriello’d himself. Jack Adams, later in his (clean-faced) Toronto career. Start, though, with the first, 1917-18, a hundred years ago. While Toronto’s first NHL franchise lost its very first game, in December of 1917, the team didn’t let that stand in the way of a championship season. This month in 1918, the Torontos defeated the PCHA Vancouver Millionaires to win the first NHL-era Stanley Cup. They did it, almost certainly, with an entirely clean-shaven line-up. So far as my researchers have been able to determine, 43 of the 44 players who skated in the NHL that first season did so free of any kind of facial hair. The question with Jack Adams, the 44th, remains: was he wearing a moustache when he debuted with Toronto that year or did he only grow it later, in time for his (and the NHL’s) second season? Before he was a trophy (awarded to superlative NHL coaches) or a division (when the league still divided itself into divisions), prior to his decades-long reign over the Detroit Red Wings, coaching and managing and shaping the team’s personality through the force of his own, Adams was (of course) a very good centreman who began his NHL career playing for and, in the early 1920s, captaining Toronto. Born in Fort William, Ontario, he made his hockey name there, too, winning an Allan Cup with his hometown (Thunder Bay Senior Hockey League) Maple Leafs in 1915. He subsequently served with the Canadian Expeditionary Force’s Railway Troops. Adams was still in uniform in the winter of 1917-18 when he skated with the Sarnia Sailors in the OHA’s Senior loop and when, that January, he vociferously denied that he’d be turning professional and signing with Toronto — just a few weeks before he did exactly that. He played in eight games that year, though not in the Stanley Cup series, having been acquired too late in the campaign to qualify. Toronto wouldn’t end up defending its championship that season. On the ice, they were altogether underwhelming, ending both halves of the season at the bottom of the (shallow) three-team NHL. When play got underway in December, the team had difficulty winning a game, losing twice to the Montreal Canadiens and once to Ottawa. By the time they lined up to meet the Senators again on New Year’s Eve, they were desperate. Corb Denneny scored a pair of goals to secure Toronto’s 4-2 that night, and Harry Cameron seems to have been a stand-out on defence.